Oregon caves abound. 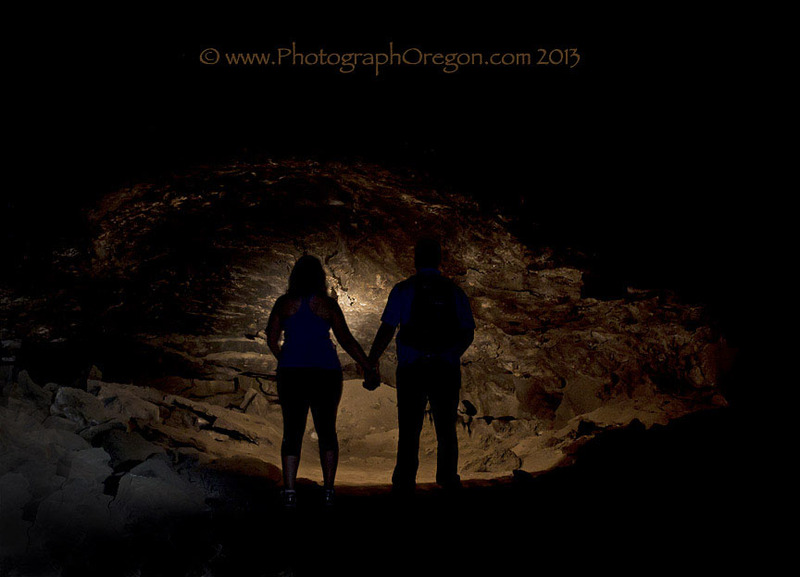 According to a friend in the know, there are now 800 verified caves in Deschutes County alone! Exploring these fragile wonderful little worlds can be a really fun and rewarding photography adventure. If three years ago you had pointed to one of these entrances and said "Let's go in there!" I would have said, "Ohhhh, let's NOT!" ...but somehow, it happened and I got sucked in to the fascination with the subterranean wonderland that is in those big dark holes. 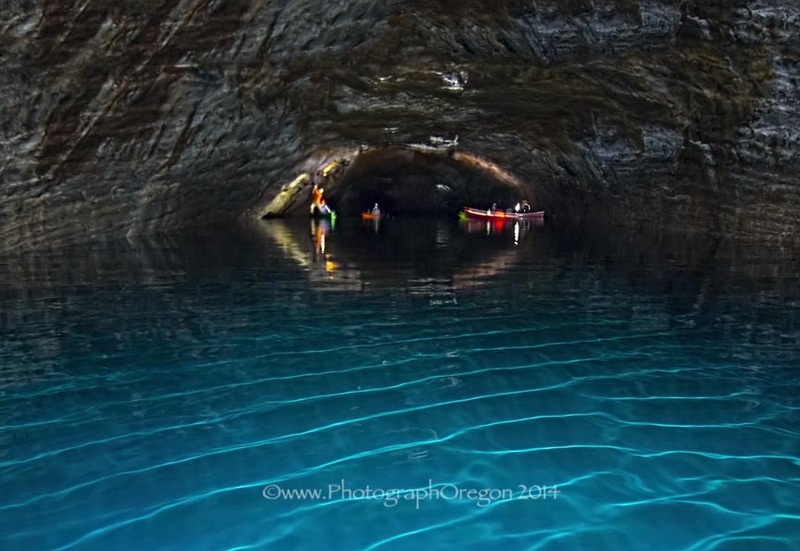 Most are lava tube caves. Some have some really great history, everything from lunar surface preparation, to ice storage for a whole city. 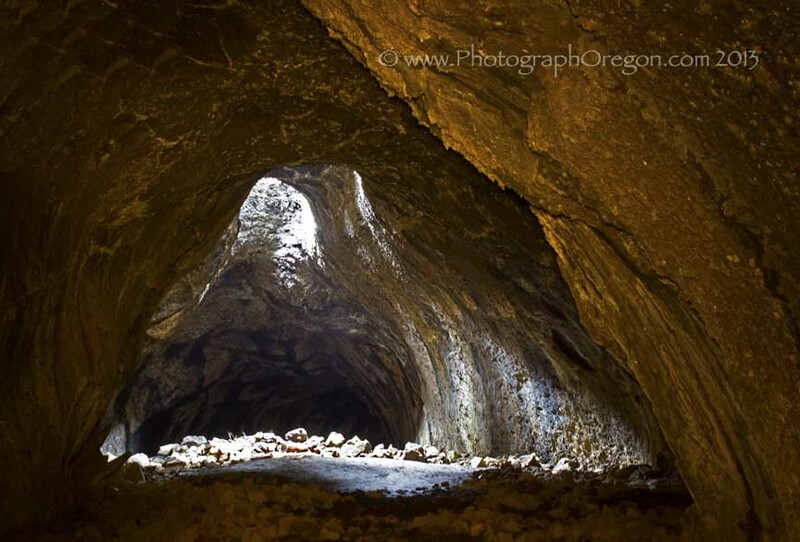 Because many of the Oregon caves, especially the lava tubes in Central Oregon maintain at 42-45 degrees year-round, they are great for photography on rainy days and also a great refuge on hot days! For now, you get the caves near me, because those are the ones I can get to. Many of the caves are closed from October 1 to April 30 for bat hibernation. Some of the caves, like Skeleton, Charlie-the-cave and Wind cave are closed all year to try and restore the bat population. Boyd Cave is open year-round. 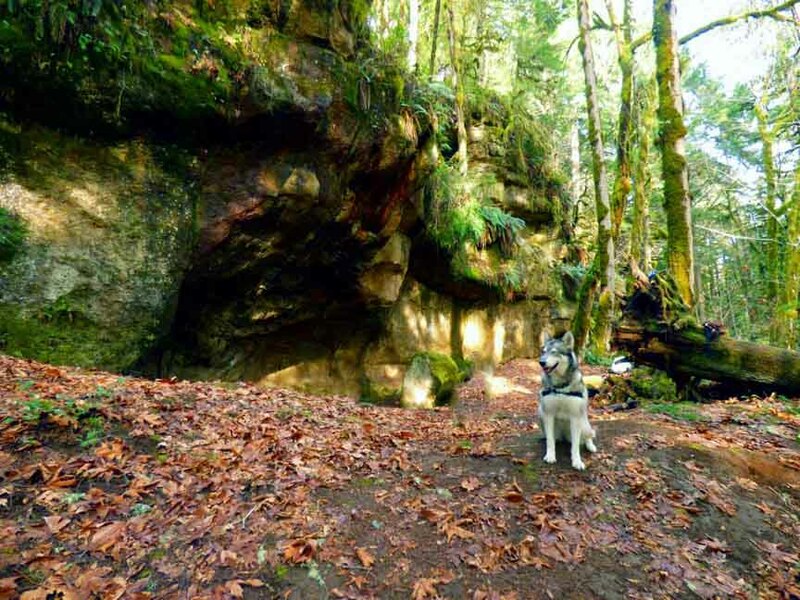 Hidden Forest cave is open year-round. Redmond caves are open year-round. ALL CAVES are closed to climbing and bouldering. Here is the USFS list of local caves and when they are open. First off. 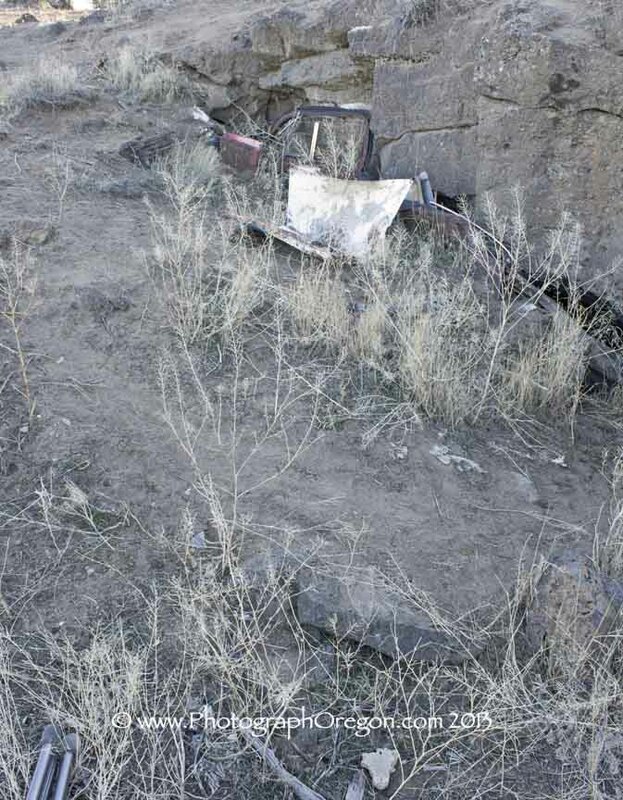 It is a federal crime to vandalize or remove stuff from caves. Take nothing but pictures! The USFS recommends bringing the following items with you. Some of the information you may have found here in the past as to locations/directions has been removed. Sorry about that. It had to be. I was pretty innocent about the nature of some people and some kind friends who spend a lot of time cleaning up the messes in our Oregon caves and trying to preserve these wonders let me know that it is a really bad idea to just have that information out there floating around the internet for just anyone with no sense of nature ethics and handy access to spray paint to find. After seeing a few this week that are just heartbreaking in their conditions, I concur. This cave below is so full of trash and junk that you cannot even look inside. Others in that area are spray painted so vile that I cannot put the pictures up here on a family friendly site. I would die a thousand deaths if this happened to Pictograph Cave because I led the way. I'm speaking in general as I know my photographer friends are more concerned with damaging equipment than vandalizing. You can always contact us if you have questions about specific caves. We may or may not be able to help you further depending on the sensitivity of the location. One find Wednesday last winter I was out with our local Audubon catching up on some fine Oregon birds when we stumbled on this small cave. This last September I decided before the bat closures began again, I would try to find it. Arnold Ice Cave is more historical than interesting. Originally called the Crook County Ice Caves (among other names). 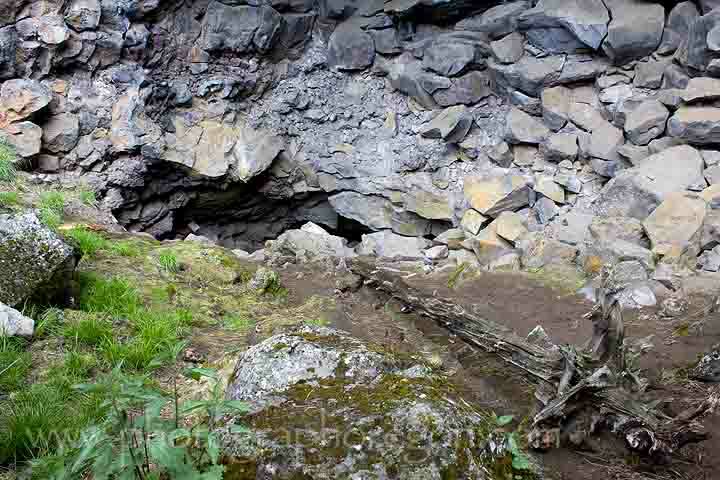 Which is kind of funny since it’s in Deschutes County, Arnold Ice Cave was the site of an early ice mining operation. The ice was sold to the city of Bend by one of the early saloon keepers. In the 1950's a trench was carved in to the ice by Jim Anderson and Phil Coyner They accessed about a half mile of passage way. In later years, after the ice mining had ended, the cave filled back up with ice making the inner passages inaccessible to exploration attempts. 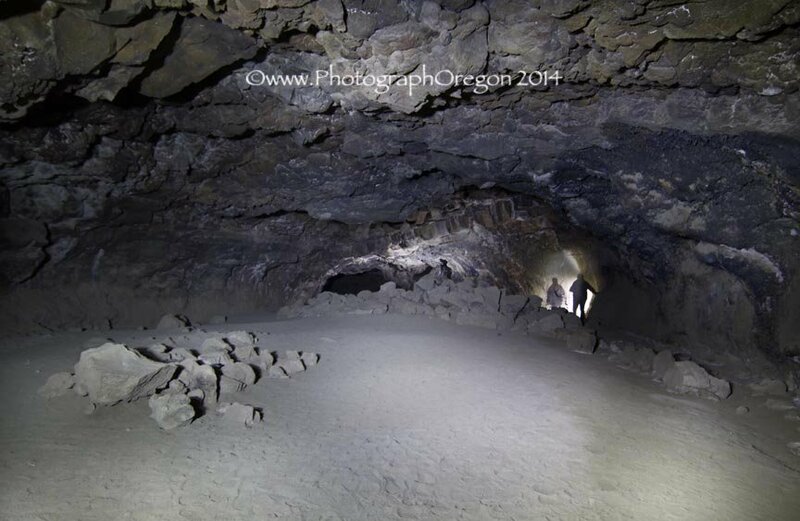 Inside is a long lava tube great for light painting. Take several light sources because if one dies, you’re totally in the dark…not cool. THREE is a great idea. (My third one is the free flashlight app on my phone). I take a large flashlight so I can do longer exposures while light painting the walls. The Cascadia Cave (which is really a rock shelter more than a cave) was our ice breaker for the year 2014. We wanted to do something awesome on New Years Day that involved caving. Our friend Brent knows all, so we called him and asked for a recommendation. Knowing that we love both caves and indian rock art, he pointed us in this direction as with it's many pictographs and petroglyphs it is considered one of the most significant cultural resources of the indigenous peoples of the Cascade Mountains and the Willamette Valley. 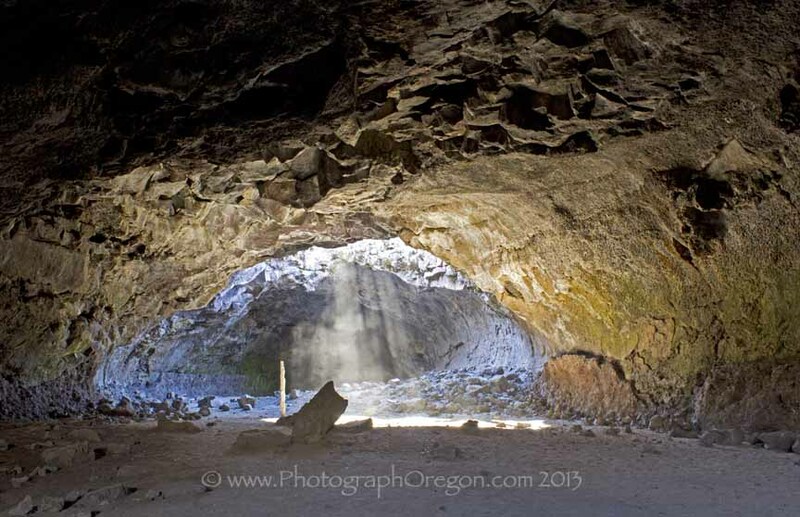 Derrick cave with it's beautiful skylights and cold war history is one of the premier year round caves in central Oregon and my newest favorite cave. So far, this is my favorite easy access Oregon cave. It is beautiful and the path in is kind of mystical with its stacked rocks and winding path. This is the one I almost never go to because at any given time there can be a lot of people in it and it’s tough to take pictures. However, the staff is awesome and if you read on the page there are tips for how/when to get great photos. 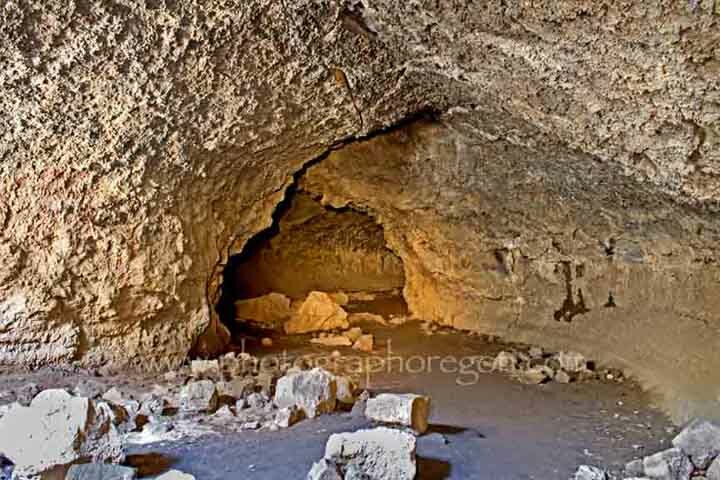 It is part of the Newberry National Monument and is a commercial touring cave. 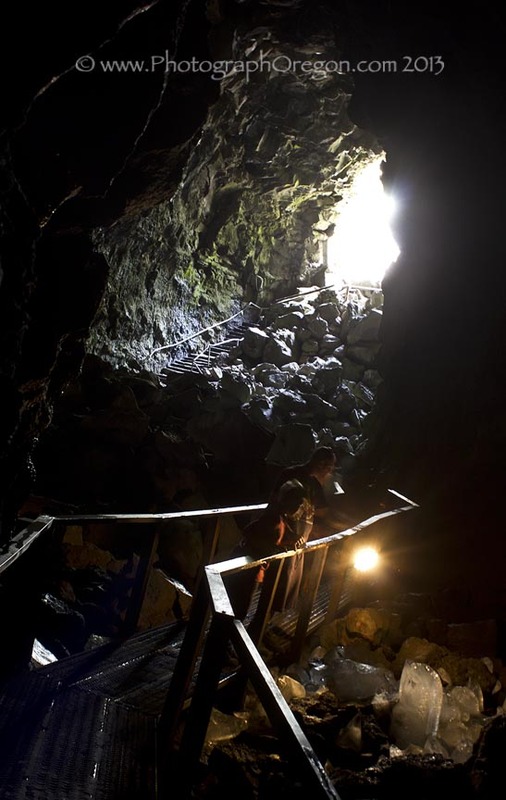 At 5,211 feet long, the northwest section of the cave is the longest continuous lava tube in Oregon and goes under highway 97. 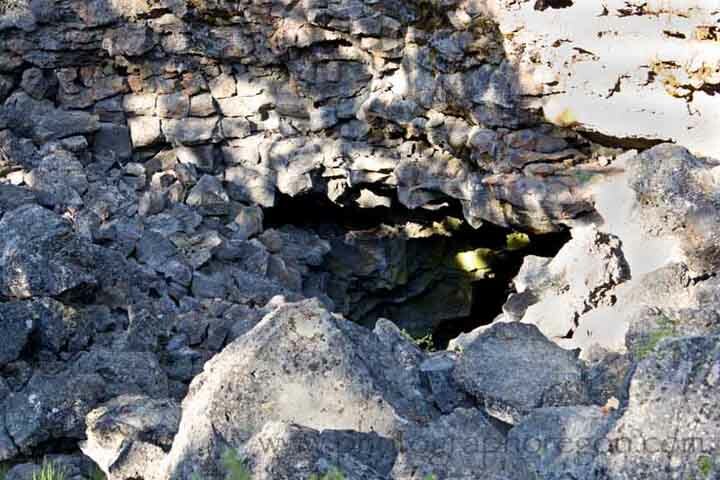 Malheur Cave, a giant lava tube cave, located on private property 17 miles east of Crane Hot Springs is owned by the Masonic Lodge of Burns. This cave is 3,000 feet long, with a varying height from 8 feet at the entrance to a approximately 20 feet farther back in the cave before the waterline. A beautiful clear, COLD underground lake fills the lower end of the cave from little springs that you can see at the very back walls if you look closely. Where the water begins varies by season and rainfall. 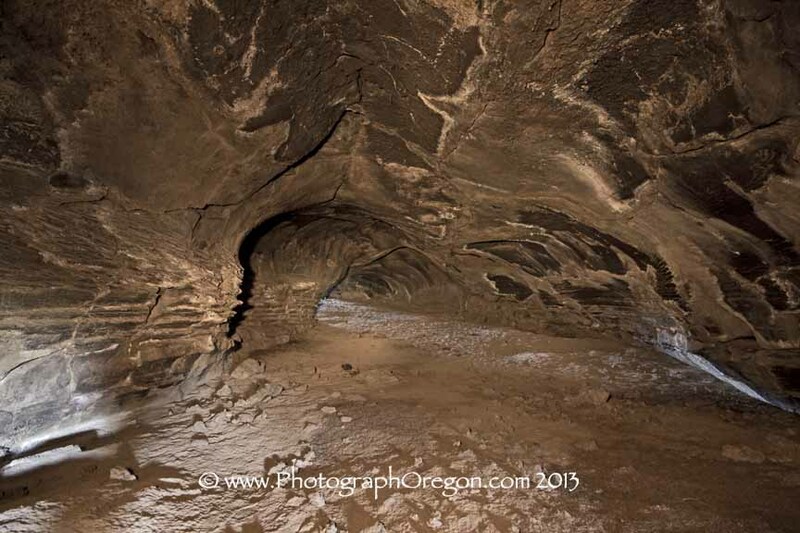 Another on the list of great central Oregon caves, Pictograph Cave is a beast, a not to be missed beast full of great caving images as well as Oregon rock art. The Redmond Caves are really FUN, but they are also one of the hardest hit by vandals repetitively. I had heard rumors that they had been so badly vandalized that they had been closed, so we drove over to take a look and they were OPEN I was really happy. Not only were they open, they were awesome. 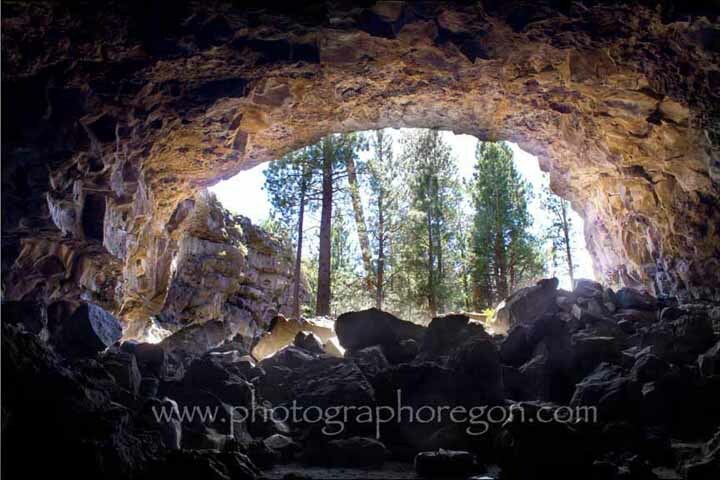 If you have lived in Central Oregon, especially if you grew up here, you will have heard of Skeleton Cave. AKA “The Party Cave”. 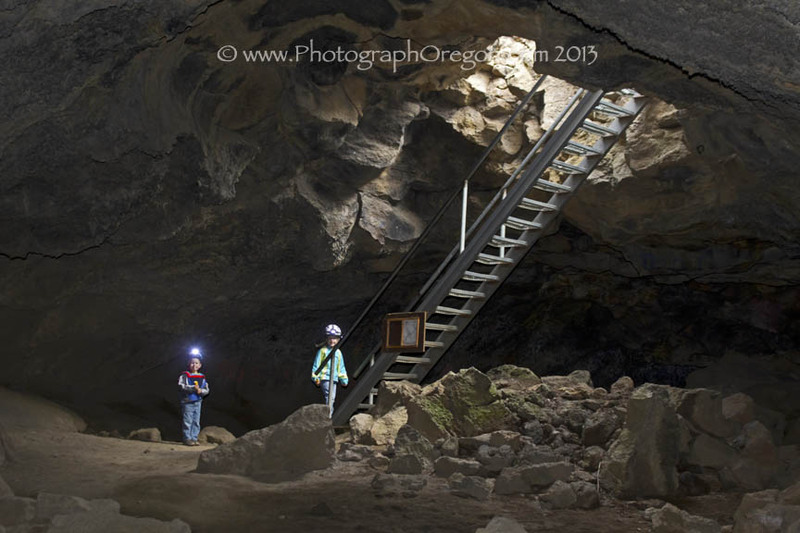 The Skylight cave has moved up to the top of my favorite caves to photograph list. This is a stunning cave with holes in the ceiling that let the light through on one side and a long interesting tunnel on the other side. Of the Oregon Caves, the South Ice Cave was my first non-guided cave adventure. I found the this cave on my way to the Cabin Lake Bird Blinds. I had passed the sign several times before I decided that I had to check it out. Mostly because I know it’s a very bad idea to go caving alone. I had asked a friend who is a serious caver about it and he told me it was a simple system and to have no fear….